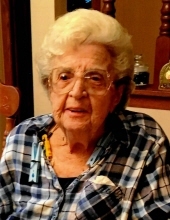 Esther T. Rumage, 90, of Rockton, IL died at 9:58 a.m., Wednesday, March 20, 2019 at Beloit Memorial Hospital. Born August 2, 1928, in Beloit, WI, the daughter of Ralph and Agnes (Lathers) Meech, graduated from Beloit High School, Class of 1946. Esther married Donald L. Rumage in Orfordville, WI on February 14, 1948. She was employed as a school bus driver for the Shirland School District for many years. Esther farmed in Rockton, IL for most of her life where she was involved with 4-H, not only as a leader, but as well as chaperoning many trips. She also enjoyed knitting, baking cookies, crocheting and reading. Survivors include son Jim (Brenda) Rumage of Rockton, IL; son Mark (Anita) Rumage of Rockford, IL; Son-in-Law Tom Streich of Orfordville, Wi; Son-in-Law Ed Specht of Rockton, IL; ten grandchildren; five great grandchildren with one on the way and sister Eva Arnold. She is preceded in death by her husband Donald who died in 2013, daughter Carol Streich and Anita Specht, grandson Mike Rumage and brother Byron Meech. The family would like to say a special thank you to Heartland Hospice and NorthPointe Terrace. Funeral Ceremonies will be held at 10:00 a.m., Monday, March 25, 2019 at McCorkle Funeral Home- Rockton Chapel, 767 N. Blackhawk Blvd, Rockton, IL with Chaplin Rod Wedel of Heartland Hospice officiating. Burial will be in Rockton Township Cemetery, Rockton, IL. A visitation will be held at the funeral home from 4:00 p.m. to 8:00 p.m. on Sunday, March 24, 2019. A memorial is to be established. To send flowers or a remembrance gift to the family of Esther T. Rumage, please visit our Tribute Store. "Email Address" would like to share the life celebration of Esther T. Rumage. Click on the "link" to go to share a favorite memory or leave a condolence message for the family.